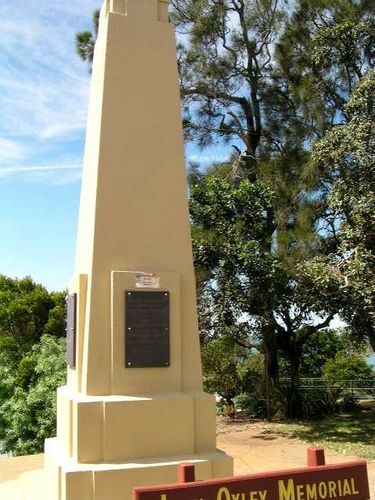 An obelisk erected by the residents of Redcliffe commemorates the landing of Surveyor General Lieutenant John Oxley. The obelisk also contains a tribute to Matthew Flinders and was actually unveiled on the 27th December 1932. The site for the memorial was dedicated in 1931. In 1823, John Oxley, on instructions from Governor Brisbane, was sent to find a suitable place for a northern convict outpost. It was on Oxley's recommendation that Red Cliff Point was chosen for the penal colony. Oxley chose Redcliffe Point as the first site as there was plenty of fresh water, fertile soil and plenty of timber for building. Altogether, Oxley sailed 80 kilometres up the Brisbane River. On 24 September that same year the brig Amity brought officials, soldiers, their wives and children, and 29 convicts to Redcliffe. I want to tell W.B.H. that the idea of the erection of a memorial to Lieut. John Oxley had its genesis at a public meeting duly called and held at Redcliffe in August 1930, and for his information inform him that as the outcome of that meeting a carnival was conducted at Redclifie at Christmas time and the money so raised, after expenses were paid, was to be used to erect the memorial. At the public meeting a discussion took place as to whether the memorial should perpetuate the name of Oxley or Flinders. and it was decided that the memorial should be to Oxley, and that tribute should be paid in the inscription to be placed upon the memorial to Captain Flinders in recognition of the part he played in naming Redcliffe as well as other islands in Moreton Bay. The Historical Society of Queensland is supplying the committee with appropriate wording to appear upon the memorial. GEO. R. SAYLE. Hon. Secretary, Oxley Memorial Committee, Redcliffe, October I.
BRISBANE, Dec. 27— Tributes to the work of Matthew Flinders and John Oxley were paid by speakers at Redcliffe today, when, the Governor, (Sir Leslie Wilson) unveiled the memorial erected on what is believed to be the actual spot where the two explorers first landed on the peninsula. In unveiling the monument, the Governor said it was a memorial to great men who had done a great deal for Queensland. The Home Secretary (Mr. E.M. Hanlon), Mr. G. H. Mackay, Speaker of the House of Representatives and Mr. Justice Macrossan also delivered addresses. 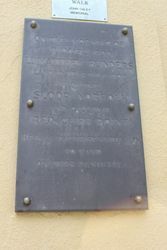 The Ceremony was some what marred by the act of vandals who removed the memorial tablet announcing that the site was decided upon by the Mayor of Redcliffe (Ald. A. Langdon). The tablet, which is of slate, with gold lettering was in place on Monday night but had disappeared this morning. The police so far, have been unable to trace the persons responsible. Daily Mercury (Mackay, Qld), 28 December 1932. He Was The First White Man To Land On This Peninsula. Erected By the residents of Redcliffe.